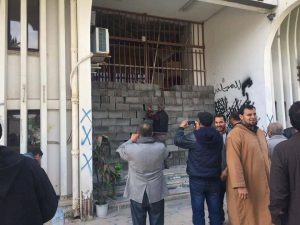 In a move to try and demonstrate that Misrata’s municipal council is no longer working, opponents blocked up the main entrance to the council building today, building a cement-brick wall in front of it. They made sure they did a proper just on it, even plastering it ready for painting. The symbolic gesture appears to have created more mirth than anger in the city, even among pro-council supporters. “I laughed when I heard about it, said one. Led by the city’s military council head Ibrahim Ben Rajeb, the opponents – allied to the struggling rejectionist movement of would-be prime minister Khalifa Ghwell – have been trying to bring down the municipal council for many weeks. After a series of regular demonstrations, they announced on 21 March that the municipal council had been dismissed and replaced by a steering committee. The attempted coup had no effect, however. Council staff and most of the city’s population ignored it. “The opponents talk about democracy and peaceful exchange,” said one local official who did not want to be named. “They then talk about replacing the council with another body of their choice until they decide to have fresh elections.” It was hypocrisy and a return to dictatorship, he stated. They did not have any legitimacy or moral grounds at all, he insisted.